What follows is a sprawling account of my 2016 Halloween season. 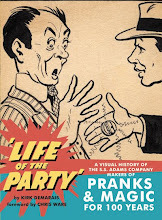 I don't think I included enough jokes to make it super entertaining, but at least its a thorough document. 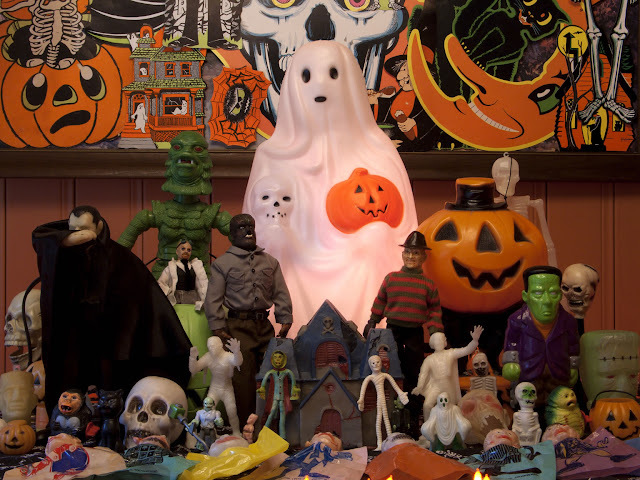 It's a disjointed collection of thoughts that amount to the story of one man's focused, and sometimes frustrating attempt to enjoy Halloween at a new capacity. September arrived. The decision to begin one's Halloween season two months before October 31st is a controversial one. Does prolonged celebration diminish the impact of the season? Can September even feel like Halloween? That's the one I had trouble with this year. Philosophically, I was all for a September 1st kick-off, but despite my yearning to dive into the orange and black it was the hot weather that presented a psychological barrier. Thanks to my ability to overthink something so petty I discovered a mental workaround for the frustration. 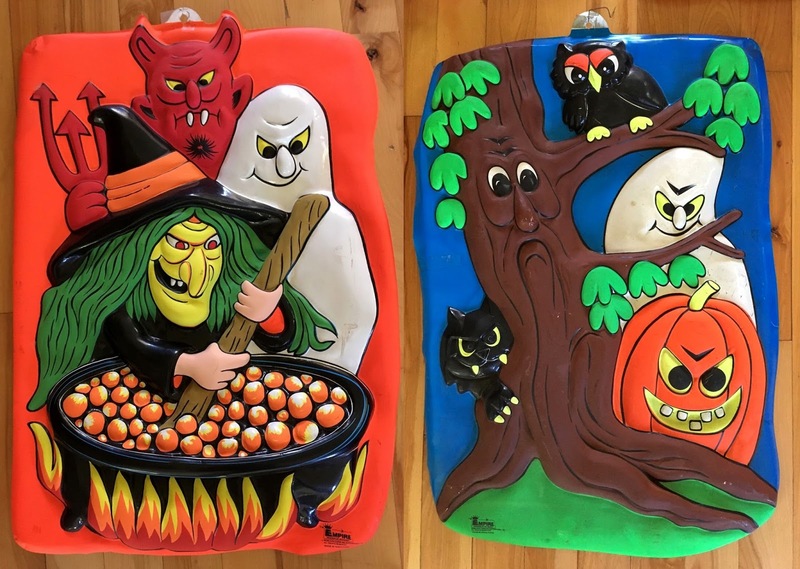 I simply designated September as "Pre-Halloween" season. It's an obvious concept, but I'd never consciously viewed it that way before. Typing up this thought process for public consumption feels like an intimate, even embarrassing act. But it was a crucial part of my quest to fully savor this time of year. Henceforth, September, or Pre-Halloween, shall be a time set aside for leisurely preparation and anticipation. It reminds me of a memorable quote from The Simpsons of all things, "To the most beautiful moment in life, Better than a deed, better than a memory, the moment... of anticipation!" In the second week of September I traveled to Tulsa, Oklahoma to meet a friend who runs a traveling antique show. 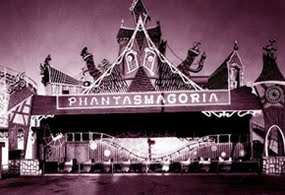 Saturdays in Tulsa are not complete without a visit to the Tulsa Flea Market, a weekly gathering that takes place in the heart of my nostalgia, former home to the Phantasmagoria dark ride— the fairgrounds. Navigating through an acre of junk-covered tables while breathing the scent of fresh popcorn was already getting me high when I noticed glowing orange lights dotting the rows of vendors. The Halloween stuff was out! I had taken mental inventory of a blow molded ghost and a set of masks before I spotted a familiar design. It was a vacuform graveyard scene that I'd last seen on a store shelf when I was in second grade. At the time it was a strong contender for my allowance money, but ultimately I left it behind. Not this time. 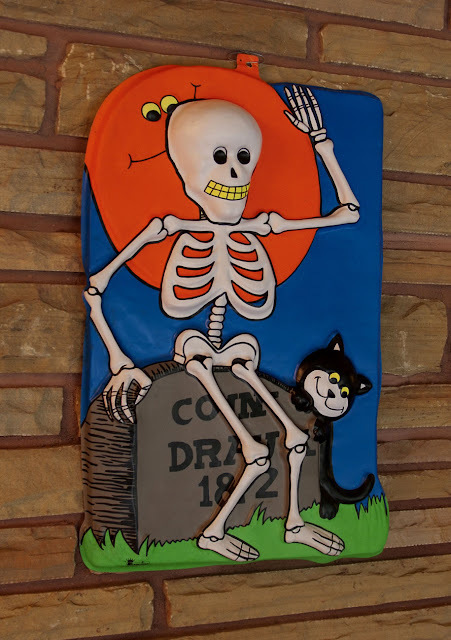 No summer weather could stop this decoration from drilling straight into a deep fount of Halloween memories. These are the moments that nostalgia junkies like myself are always searching for, often fearing that we've exhausted them all. This object is a bridge to my young self, not just standing in an aisle of fresh Halloween product, but also standing in a new school semester, with new weather, new classmates, new television shows, new book orders, new events, and new Christmas wishbooks. It's the realization that Fall isn't so great because it contains Halloween, rather, Halloween is great because it happens during the Fall. Ironically, Spring, with it's many endings (and terrifying tornado sirens) can never offer the sense of renewal that Autumn has. In late September the preparations continued, and by that I mean I bought more stuff. One can only stare at a wall decoration so long so I set out to find some cheap and spooky media. The 8-film Horror pack for five bucks fit my needs (the one with Chopping Mall, C.H.U.D. II, and Waxwork). 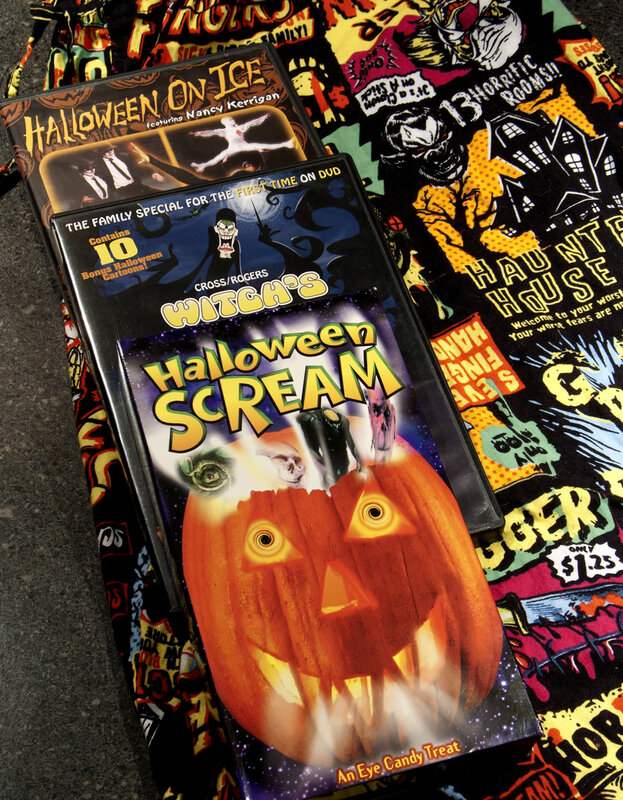 Also meeting my requirements were some choice items from Oldies.com, a favorite storehouse of discontinued stock where I picked up Halloween Scream (1993), a slapped together collection of early computer animation from the Mind's Eye series. I also got a childhood favorite Witches Night Out, as well as Nancy Kerrigan's Halloween On Ice, a 1996 extravaganza in which Kerrigan choreographed a routine to John Carpenter's Halloween theme that involves dozens of skeleton ice skaters. (The DVD dealt a crushing blow by omitting this particular performance! Lets hope for a complete Criterion edition blu-ray). Anyway, I also found some nifty mail-order inspired lounge pants! 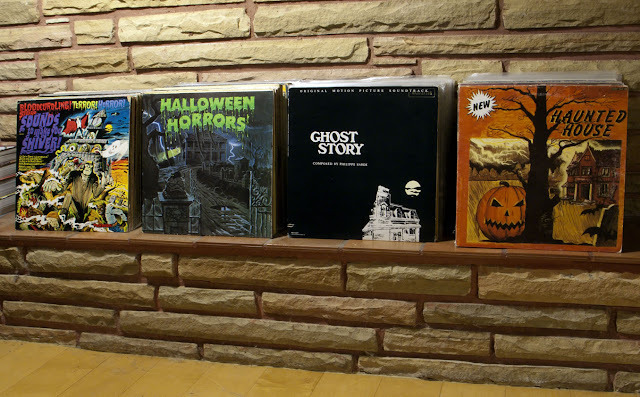 Lastly, I expanded my collection of Halloween audio tapes. I will likely give these a separate post at some point. There's one called Haunted Mansion Cassette Tape that's given me little jolts of joy ever since I hung it up months ago. The natural (hedonistic, materialistic, greedy) thing to do was seek out more of this pleasure with more tapes. 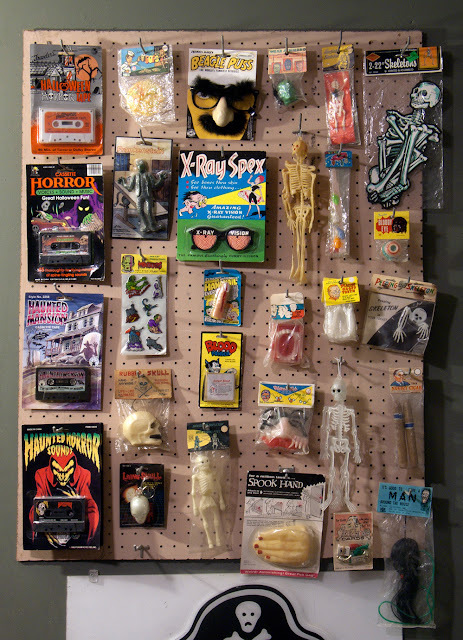 My set of four inspired me to update my pegboard display with a spooky theme. I realize its a bit skeleton and skull heavy, but that's a problem I'm willing to live with. "...One that stuck with me came from an overheard conversation that my mom was having. (The same lady who professed nearly every classic urban legend in the book, from the lady with the beehive hairdo full of spider eggs, to ankle slashing gangs, to the kid who tried on a coat and got bit by a snake hiding in the lining.) She was talking about a prominent missionary who made a series of audio tapes based on his experience exorcising demons in third world countries. These supposedly included actual recordings from exorcisms. The series of sermons was on a collection of a dozen cassettes, and they were available only to those professionals who might need to deal with real demons. The thing is, the missionary gradually revealed information to the listener in controlled increments. The listener HAD to listen to them IN PROPER ORDER to build up an understanding and immunity to the powerful spiritual truths. BUT what if someone happened to pop in cassette twelve WITHOUT hearing the eleven previous tapes in order?... They would literally go INSANE! My mind struggled to imagine what that tape sounded like (it probably sounded like the Hell scene in Event Horizon) and how horrible it would be to accidentally pop that final tape in my boom box. Chills!" "I distinctly remember that the panic in my area kicked in the day after this Geraldo Rivera special. (One of the murders wasn't too far from where I lived.) After that, there were local warnings about a nearby lake where it was said that Satanists blocked the road with fallen trees. If you approached them, they would cut down a tree behind you and trap you, and you were done for. There was talk about a white hearse that drove around town with tinted glass windows. Someone supposedly got up close and saw a bloody pig's head in the back. There were rumors about rituals in a local party spot called Acid Field. Same goes for a place called Zero Mountain. Funny thing is, all of these warnings backfired, and life became very exciting for my friends and me. We were just old enough to drive, so every place on the 'do not go' list turned into a potential adventure for us. I investigated Acid Field, and Zero Mountain (which wasn't close) and the lake with the fallen trees (and we actually saw some!). It felt like suddenly there were adversaries all around us, and we were the heroes ready to shed light on their evil. It was thrilling. And then there was the rumor of the Halloween haunted house that was a couple towns over. It was said to be a multi-level deal with a huge admission fee. However, if you were brave enough to make it, your money would be refunded, ten dollars for each level passed. But nobody could actually make it to the end on account of it was so terrifying. When the internet came along I discovered that this was a nationwide legend that I had put my total faith into. I love that my little town was so privy to so many national legends. The latest fashions and fads passed us by, but if you're talking misinformation, this place was a sponge, and my little world got very interesting." 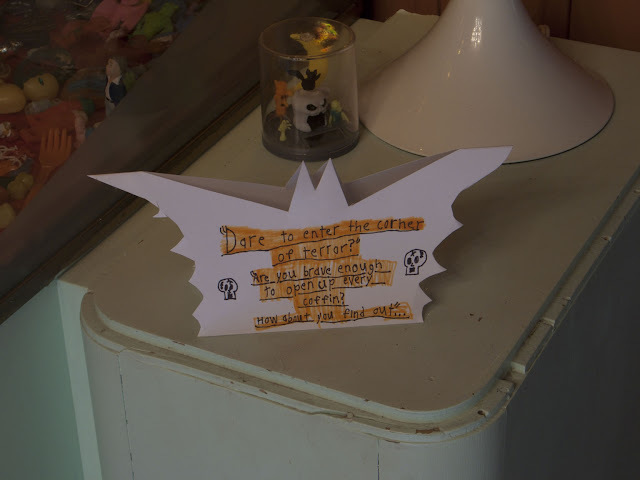 One of the Dinosaur Dracula topics was '2016 Halloween to-do lists.' I was way ahead of them. This year the stakes were too high to go wandering into the season without a game plan. My list seemed unrealistic as I typed it up, yet somehow I've fulfilled about 95% of it with a few days remaining. I've pasted it below, however, you might want to skip it for now because I'm about to elaborate on it item by item. On the last day of September I finished a relatively involved freelance job that had been lingering all summer long. During the final leg of the project I got an email from a potential client offering one of those 'week-long, drop everything and work fourteen hours a day' jobs. They even offered a special 'rush bonus.' It seemed like some cosmic test, and I'm not sure whether I passed or failed, but as much as I could use that paycheck full of rush money, I couldn't do it. Instead October first was the day when a couple friends and I made a two hour drive to a Halloween festival. It takes place on the converted grounds of a Renaissance fair. There's a building that resembles a castle and a little fake town that's all decked out in Halloween. 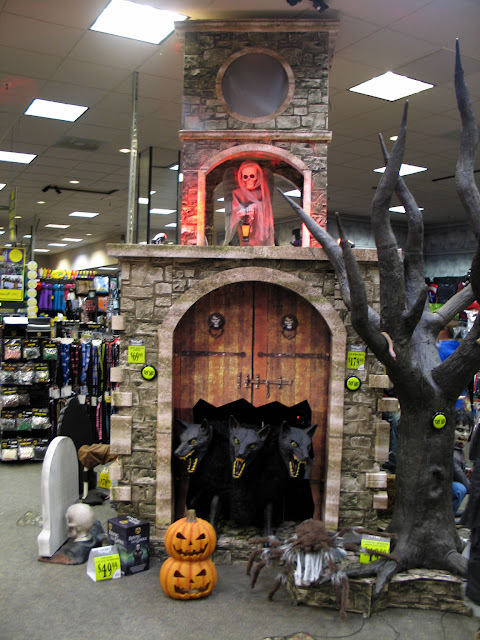 They set up a number of walk-through spookhouses that are somewhat elaborate and plenty satisfying. It's cheesy and chintzy (like me), but I've been back at least a half dozen times over the years because there are few other places, especially nearby, where the Halloween spirit is so tangible. It's the flaming torch lights, and the dance music (Thriller, Time Warp, and that Somebody's Watching Me song with the Michael Jackson backup vocals) and the costumed workers who all speak in leftover British accents from the Renaissance fair, which doesn't quite make sense. It's the smell of gasoline from the guy with the chain-less chainsaw at the end of the haunted house, and the smell of carnival food competing with the smell of cigarettes (which are being overtaken by new gangs of vape enthusiasts). I stood in the ticket line ready to pony up (I never say 'pony up') for the Fright Combo which includes the four scariest attractions according to their skull rating system. 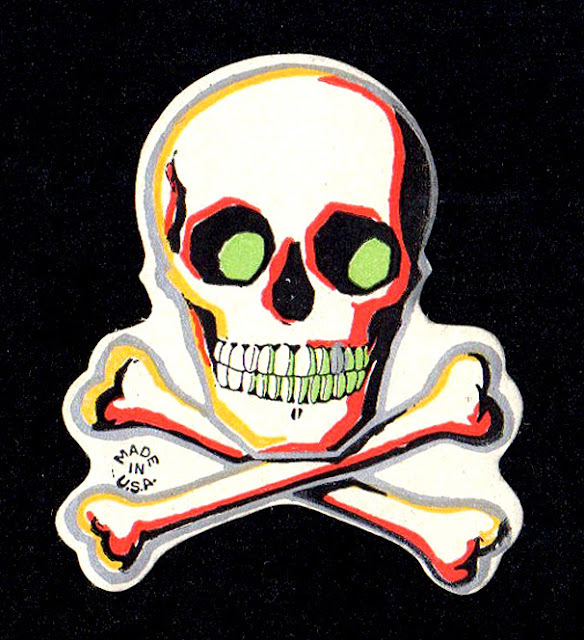 None ranked fewer than four of the five possible skulls, and one broke the scale with an astonishing six skulls. When it was my turn the cashier informed me that their card machine was down. My plan had involved using a card. No problem, they had ATMs on site. We discovered the ATMs were connected to the same network as the card machines (reminder: they were down). Our only option was to relocate our car in the vast, dark festival parking lot and drive to the nearest gas station. The gas station ATM was conveniently located near the front door. So convenient in fact, that using the machine required a four dollar fee. That Nancy Kerrigan Halloween on Ice DVD cost me less than four dollars. My friends and I took our financial spankings and got the cash. You probably understand how these kinds of hurdles have a way of diminishing the fun factor, so I announced to my friends that I would ask the festival cashier for a discount. Even I didn't believe the statement because yeah right, like I would ever ask the cashier for a discount. We re-parked, re-walked in, and re-stood in line. I went to the same lady who gave me the news about the card machine. She told me that the card machines were down. I explained my brief history with the card machines, and I asked the cashier for a discount. It was like an out of body experience for me. Her reply? I doubled down, and moved to phase two. "Could I talk to a manager?" At that moment a man opened up a door behind her who looked managerial relative to the rest of the British accented spookhouse operators. I heard myself addressing him directly. He half listened to my woeful tale. He replied that the Fright Combo, at thirty dollars, is already such a great deal he simply couldn't go lower. As if he were paying his spooks by the scare and I would push them over budget. Then I tapped into some unfamiliar part of myself and I made my case again, though I never lost my smile or the demeanor that I learned from watching George Costanza try to charm strangers. We had a full blown back and forth. He perked up when he learned that the gas station was charging a four dollar fee, and suggested that he could raise his own ATM fees. I contested, but about that time he reached over and typed a code into the cash register causing my admission to ring up four dollars less. I can only hope that my refund wasn't his way of compensating me for valuable intel. Whatever his motive, from that moment on I was riding a tempest of pure victory. 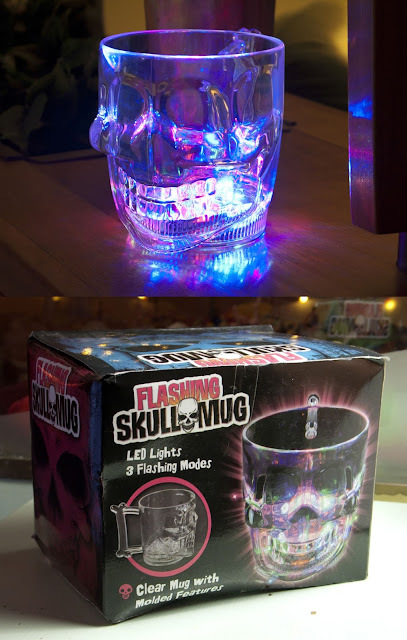 Between spookhouses I walked into one of several souvenir shops and bought a skull mug, just as my list instructed. The price tag: four dollars. It serves as a trophy for my consumerist conquest. "It HAS to happen. I just wish I could see it!" A couple minutes later the line worker called out for a party of three. Somehow nobody in the rows ahead of us qualified. The three of us were directed toward the entrance where we were teamed with the Michael Myers and Sally! "She didn't want to go through by themselves." we were told. "I can't believe it! We get to see it!" I yell-whispered to my friends. Once inside, I listened for the Halloween theme music as we approached each room. There was a Freddy and even a Five Nights at Freddy's before we finally encountered The Shape. The spookhouse Myers followed us into a room and I turned just in time to see the twins notice each other. I frantically patted my friends and repeated, "It's happening!" They stood almost face to face, but instead of the mirrored gaze I imagined, they high-fived each other; a much smoother outcome than I expected. My prophesy didn't come true, but the combination of the line jump and the granted wish to see the Myers meetup seemed like a cosmic phenomenon. I went to see the Blair Witch sequel on opening weekend. I was entertained and it satisfied my curiosity, but I missed the subtlety and the feeling of genuine dread that was caused by the first one. Seeing it in a Sunday matinee on a hot afternoon didn't help. Then a few days ago I also watched Miss Peregrine's Home for Peculiar Children, and enjoyed it more than I thought I would. I knew going in that it has a Harryhausen-esque skeleton battle sequence and a prominent ghost train dark ride, so everything else was just bonus. 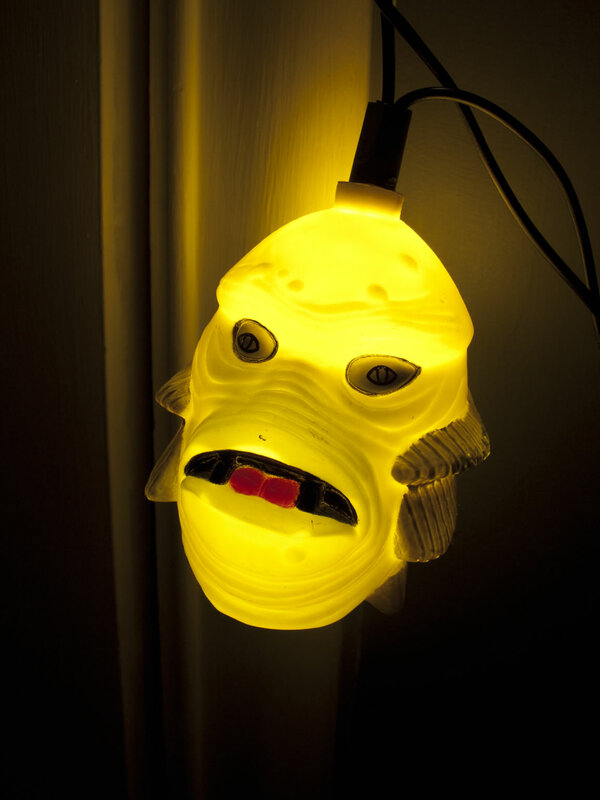 I've amassed about a half dozen blow molded Halloween pieces since the 1990s along with other light-up stuff. Each year entropy claims another bulb or fuse leaving only a couple that still work. This year I made good on my vow to bring them back to life. It only took three different trips to Lowe's and Walmart, but they are now spooky, yet functional beacons. Rekindling their glow was probably the most symbolic task on my list. Though it doesn't support my little theme I included these vinyl Halloween puppets. About fifteen years ago I got overzealous in an ebay bidding war and way overpaid for them. It's taken me this long to find peace with my folly. The best thing about my mood table is that it inspired my son to make one of his own, which he calls the Corner of Terror. 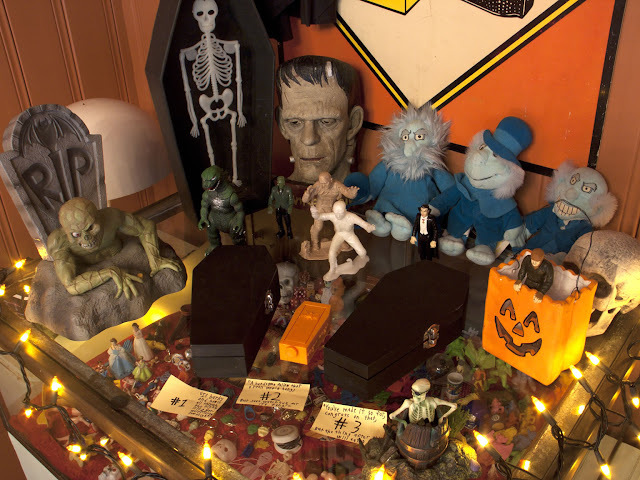 Not only did he put together a bunch of stray monsters, he set up a series of poetic instructions that ultimately lead the victim to open a coffin filled with spring-loaded snakes. 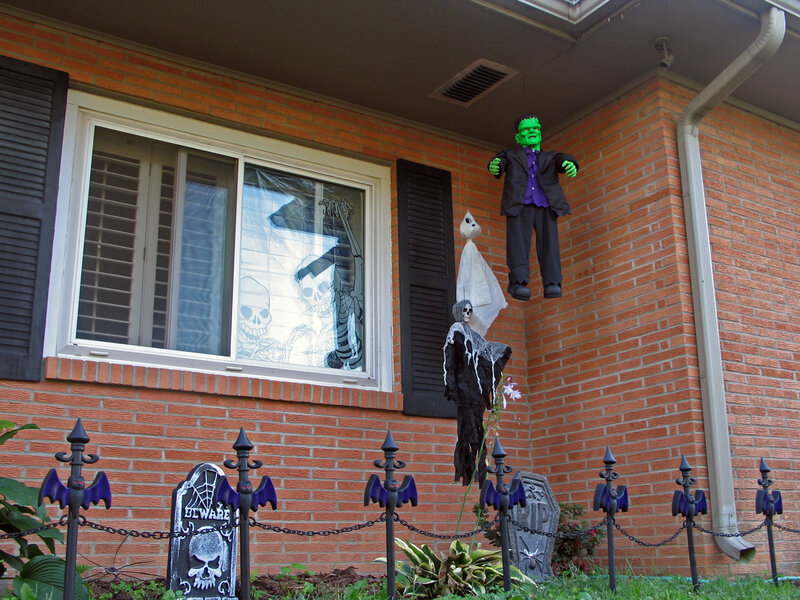 The thought of extending my Halloween decor to the outdoors has always been overwhelming. Maybe it's because I know I can't create the amusement park level Halloweenland of my dreams. And aren't you just begging to be robbed or vandalized? But this year was the year. My son and I invested a total of nine dollars (plus a Frankenstein figure a buddy gave to me years ago) and decorated the flower bed out front. These are baby steps, but it felt good, and it ties into #14 on the list— hand out candy. As we worked on it, I noticed my next door neighbor decorating their porch too. 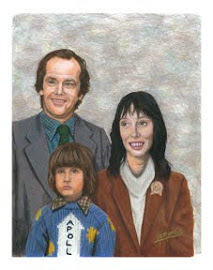 It was like a Rockwell-esque fantasy. This may not seem Halloween related, but Fall is my favorite time for taking day trips, and they're all the more magical when you see occasional spooks and pumpkins in small town store windows. There's also a decent chance that flea markets and antique shops will have some seasonal products out. I had to go about an hour out of town to find an entirely untraveled route. My carefree mindset took jabs from the many political signs along the way, but the good weather nearly evened things out. The towns I visited under-delivered on places to stop. One Main Street had a stretch of inviting second-hand shops according to google maps, but the street view photo must have been taken before all the "Going out of business" signs went up. Well, I can check off the first half in this entry in a big way, but this year I didn't get to Dead Space. I can't explain the eternal attraction (addiction) I have to Left 4 Dead. Each time I log in my Steam account I see my shameful number of total hours played (deep into triple digits), but I just keep going. It's got about eight zombie-filled co-operative missions to choose from, and they play like endless reruns. I think that's the draw. I'm so familiar and comfortable in that harrowing world that it's as soothing as watching old Brady Bunch episodes. Worst part is, I'm still not very good at it. I'm currently on page 559 out of 1092. I've enjoyed it so far, especially the way it hops back and forth between the 1950s and the 1980s, two of my favorite decades for nostalgia. The meandering pace of the story is probably the reason I'm comfortable writing such a bloated Halloween post this year. The process of walking the aisles and picking out movies has become so foreign so quickly. I had the store to myself for a full half hour on both visits which made the experience even more dreamlike. Adding to the effect were a slew of burnt-out overhead lights, as well as other fixtures of Soviet style commerce. Still, my hunt for movies was easily as enjoyable as the viewings themselves. This makes a ton more sense when you consider my masochistic choices: The Rob Zombie Halloween II remake, that Nightmare on Elm Street remake, and the Poltergeist remake. I knew better, but my raw curiosity had been nagging me for years. But I did like Silent Hill and Frailty. A few years ago I discovered a not-so-nearby small town video store that was liquidating their horror section, and I was the first collector on the scene. I snatched up all the titles that looked fun or hard to find and these filled me with complete contentment. My suspicious activity (An out-of-towner who repeatedly sifts through video tapes like he's deciphering ancient texts) made me memorable to the owner, who seems like an eccentric fictional character who was written on a tight deadline. (I suppose I'm like that too.) Inevitably the two of us started having conversations of increasing length, discussing the histories of the store, the town, and eventually, our own families. This August I returned again to confirm that there were no remaining must-have VHS tapes. Amazingly there weren't. I chatted with the owner for about a half hour and was about to leave empty handed when I noticed a stack of tapes behind the counter that I hadn't seen before. It included: the Italian film Demons, as well as Night of the Demons, it's sequel, and Deadtime Stories. These are fan favorites that I'd never watched, and couldn't imagine finding in the wild again. The owner seemed surprised by my second approach, yet eager to return to our talk which he had steered towards the topic of conspiracy theories, something I don't have a lot of patience for. Or so I thought. My return must have been misconstrued, because he became uncharacteristically fired up, asking me leading questions and insisting I read long articles while he waited. Typically I'm someone who genuinely listens as opposed to just waiting my turn to talk, but this time I was laser focused on finding an opening to wedge in my question about the video tapes. His tirade lasted another hour, as all of my signals and attempted exits were denied. He covered the textbook cover-ups including: the murderous Clintons, Obama's citizenship, the fact that US dollars are meaningless, the dangers of cell phones, the government's use of fluoride to sedate us, JFK, toxic medicine, 9/11 of course, and yes, even the fake moon landing. Finally there was a pause. I asked, and he was happy to part with the videos. However, somebody had alerted him that these particular tapes were "collectibles," thus they were not priced at his usual dollar fifty rate. Four for twenty was as low as he'd go, and amazingly this was almost a deal breaker for me since I was primed to pay the typical blowout prices. Then I came to my senses and realized that I was past the point of no return. I took out my debit card. Somehow during the previous hour I didn't clue in to the fact that there's no way this guy would accept debit cards. I found a Dollar General store down the street where I could use their government controlled card readers to get some cash back. Oh yes, I was painfully aware that the convenience fee (two dollars this time) would corrupt my deal on the tapes. But by then I had lost all free will. I was strapped to the belly of a monster I had sired in the video store. The sting of this inconvenience faded when I discovered the store had just put out their Halloween candy (in early August!) The fates had spoken so I bought my first bag of BRACH's candy corn of the season. That's right. 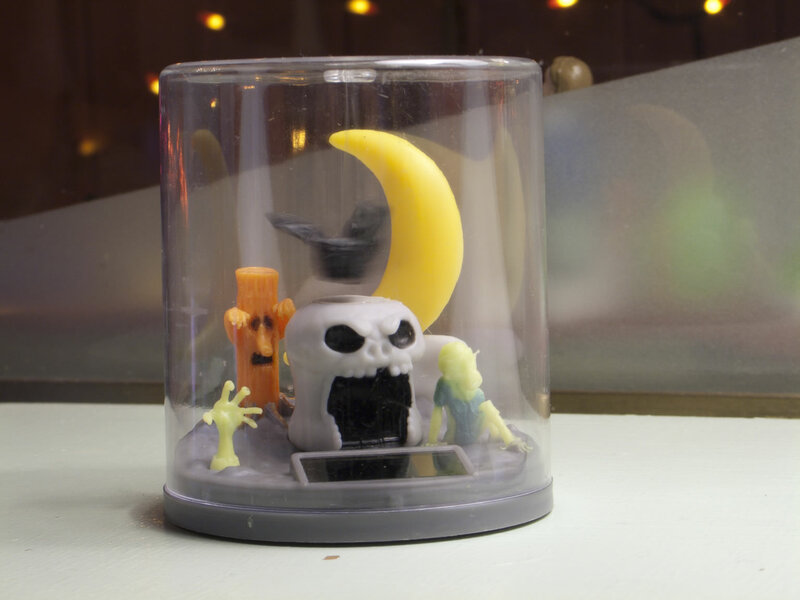 This is my second petty, long-winded Halloween story that involves unexpected ATM fees. I returned to the store and pointed out that unfortunately I had to pay with US dollars which, as you may recall, are meaningless. He accepted my payment. I placed these tapes in a reserve of 2016 Halloween choices. I've watched a third of them so far. By "party" I mean that I invited two friends over to sit on my couch. One of them was able to make it. The movies were background noise as we talked about other movies. It was a very fun night. I can check this one off in just a matter of paragraphs. What's even neater was a different, very foggy night when I talked my son into going on an impromptu walk. I bribed him with an ICEE after bedtime and we ended up visiting two different convenience stores. I didn't bring music, but we talked the whole time, and I'll never forget it. My son turns eleven soon, that precarious age when some of the greatest thrills of childhood become endangered. (I say a 'thank you' prayer every time he holds my hand in public.) Most of his friends are already proclaiming that they've aged out of going door to door for candy. I hope my son will stick with it a few more years. (I did, despite being ridiculed, though it was nothing new to a guy who never packed up his childhood toys.) However, I'm planning a transitional year of both candy getting and candy giving. I'm looking forward to it: open windows blaring spooky sound effects that were recorded in the 80s, something black and white playing on TV, standing among my fully functional decorations and my mini-graveyard, and making a memory so great that hopefully my son will write about it on the internet in thirty years. Great post! I always enjoy reading them. Considering the way I neglect this site, I'm grateful for every last visitor. I just read your new post while listening to one of the supreme Halloween playlists I downloaded from Scar Stuff's blog, which I found through your blog last year. Reading it was a highlight of my Halloween season! 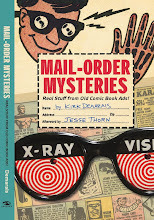 I've been a fan of Secret Fun Spot/Blog, your artwork, and your sensibilities in general for several years now (plus I love Mail Order Mysteries, which I got for Christmas). I don't think the post is too long; in fact, I'm secretly hoping you'll write a Halloween-themed book sometime! 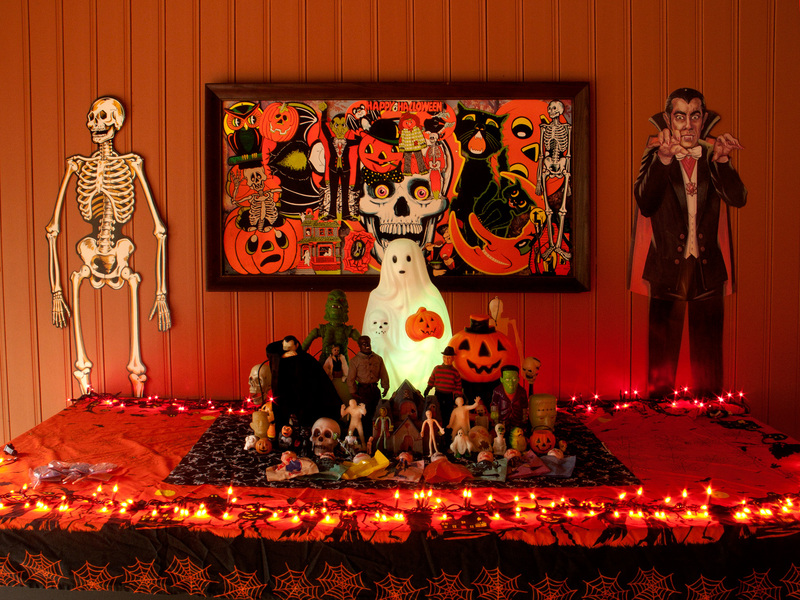 We have an annual Halloween table, too- this year my husband set it up and I displayed my Halloween-y records and old Beistle wall cutout thingies around the living room. I'm digging the Ghost Story soundtrack you found! Thanks so much for writing this post. Nice work, as always! Happy Halloween! Thanks too for all the encouraging things you said about my other stuff. I share your secrete hope for a Halloween book! I've hit a couple dead ends in that realm, but it still tops my list of dream projects. If you post your table setup somewhere online then feel free to share a link with us here. I'm sure it would be appreciated. Again, thank you for all the moral support! Every time I read one of your posts I get very sentimental. I have fond childhood memories of Halloween and family vacation road trips. It’s nice to take a diversion from this crazy election season and find a happy place. Thanks and keep on writing. That's pretty much the best response I could ask for. I'm so glad that I could give off some nostalgic goodness among scary times. Thank you for the encouragement. "I returned again and again, each time lowering my standards for what I deemed worth buying." I did the same thing when Blockbuster and Movie Gallery closed down. Yes, the worst is when I'm super picky and refuse to buy something on multiple occasions, only to regret it once it's gone. Then there are the times I regret not buying something that slipped through my fingers, then I discover that it's actually still available, then my interest wanes again. Such a dumb human. I hope you get past your blues. I've felt so much pressure to use my free time in a Halloween way that I'm almost relieved now. Not every movie has to be scary now. And since I avoided almost all non-spooky entertainment for nearly two months, I have a backlog of stuff I want to see/play again. I do wish today's rainy/cool weather would have come about three weeks ago. What a wonderful post. I wish I had seen it before Halloween, but this'll do. For those of us who live in places where seasons are theoretical, writing about adventures like these are a really fun way to enjoy fall vicariously. I'm glad you took your list seriously and got to do almost everything on it. And despite your travails at the video store, that's a pretty sweet VHS haul. Hope you'll be posting more articles soon. When months go by with nothing new, I always worry you've joined the huge list of formerly great bloggers who've abandoned their sites and moved on to other things. A sincere thanks to you Modok! I am indeed thankful for the seasonal cycle where I live. It helps offset the less desirable aspects. The holiday also goes well with a less cosmopolitan setting in my opinion. The posts may continue to trickle, but I've got plenty more in me. Knowing that there are interested readers is a great motivator! Fuqua, good post. Next time you are listening to the Stranger Things Soundtrack walking to White Oak Station...I'm going to kill you. Thank you Wu. That's interesting because I thought I had already killed you. I don't know how I missed this post (especially since I have your blog linked from my own! ), but it was a welcome respite on this first day of February. I love the idea of making a list of Halloween season to-do's. I make my own mental list, but the idea of writing it down seems like I might be more inclined to actually complete it. Lots of great suggestions and you had me laughing hard during your run-in with the video store conspiracy theorist. Also loved the urban legend of the priest tapes. You may not post often, but when you do, you knock it out of the park. Thanks. Thanks for the encouraging words Tom! If you do make a list next season I hope you write about it. Yes, this was the first year in recent memory that I didn't feel like it got away from me. Christmas was a different story. I should probably make a list for it as well. Seeing your comment was a good reminder to pop in on your blog where I had a good time browsing. It always gives me the itch to go treasure hunting. I should probably pay another visit to the conspiracy guy again soon and have a less stressful conversation. Crazy conversations in video stores are rare these days, and each time I go back I'm afraid it will be gone. Those are the moments that make you feel like you're living a movie. Hello! I ran across this blog after coming back to visit your Secret Fun Spot after a long hiatus. 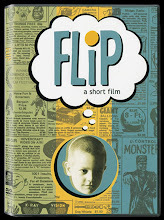 I had renewed interest when I got my copy of FLIP back out to watch it. Actually, to make a long story longer, my wife and I teach Sunday School to 1st grade boys and each week we finish the class with a short cartoon (usually something fairly "safe" like The Herculoids, Space Ghost, Jonny Quest or one of the 60s Marvel Superhero cartoons). The week before last one of our fellas asked if we could watch a MOVIE next time. Obviously, there isn't time for a movie and trying to run one across several weeks has its problems. So I brought in FLIP and I was pleasantly surprised that they responded to it so well. They were especially tuned in to the part about the bully and how Flip managed to hang on to his dollar (which became suddenly even more valuable!). Anyway, FLIP strikes a chord with me as I have spent several years tracking down old stuff I used to have (Thanks, eBay) and a lot of stuff I never did (couldn't afford or couldn't talk my parents into at the time). I think I am a bit older than you (50) so I caught the tale end of the 60s Monster Craze but I had a horror host (Sir Cecil Creape) and managed to enjoy quite a bit of that pop culture wave thanks to older cousins (Odd Rods, Weird-Ohs, monster model kits). I also totally relate to September being pre-Halloween. 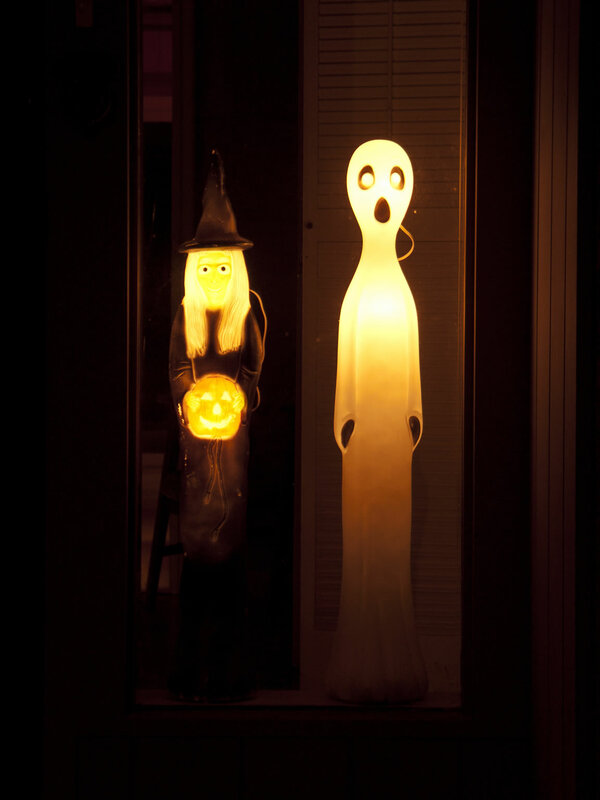 I usually celebrate each year decorating inside and out, looking for some new Halloween doodad (a unique doorbell last year) and attempting to watch a movie a day for two months till Halloween night. This can be problematic and sometimes instead of a full movie I'll get out an episode of Thriller or The Outer Limits.. but usually I can pull it off. My tastes run to 50s and 60s sci-fi fi/horror (The Four Skulls of Jonathan Drake, Angry Red Planet or maybe It! The Terror from Beyond Space) but lately, I have been revisiting the 80s as well (Witchboard...Fright Night). Anyway, sorry for the long post from a total stranger but I felt compelled to respond as a "kindred soul" who longs to grab that Halloween feeling every year. 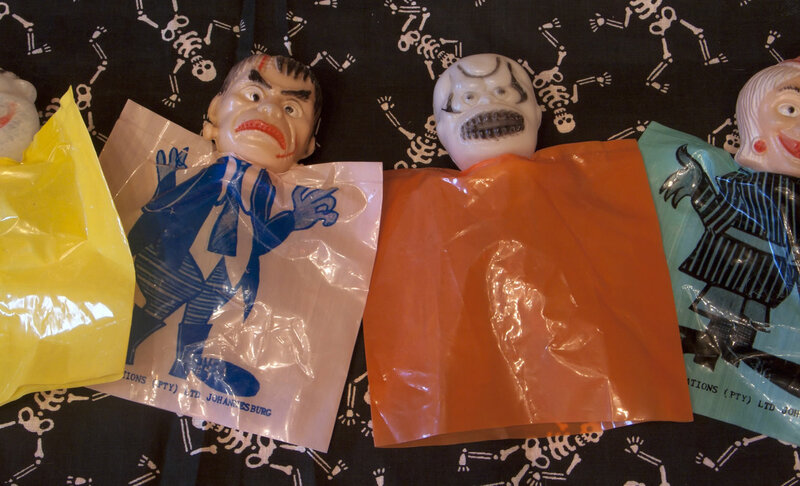 The feeling that I used to get as a kid when my local Five & Dime (for me it was Douglas & Irvin in Springfield,TN) would put out their Halloween masks and novelties to my everlasting delight. Chester- Thanks for letting me know about the Sunday school Flip showing. I love envisioning that scene! Yes it definitely sounds like we have more in common than most strangers. Thanks for sharing your other thoughts as well. I'm glad that you found this place. Let me be the first to wish you a Happy 2017 Halloween! And a Happy Halloween 2017 to you as well... in advance! One other thing to add to your list is something I have recently started doing... to set up a projector and screen movies on "the big screen". I actually use a 100" window shade as a screen and I finally got a decent projector (they have dropped in price over the years what with all the 4D technology etc).... As for me, I like the "old fashioned" way (except that I do have DVDs and some Blurays). Excellent post! I got a little teary eyed near the end when you talked about building memories with your son. My son is 13 and he generally doesn't like going trick or treating (it's usually 190 degrees here in florida) but this year he has proclaimed he must go...it may be his last year without having to hear "Aren't you a little too a) old b) big c) mature?" from the candy-giver-outers. We do Halloween big at our house too. It's on my Halloween to-do list this year to have my son do a mood table/corner. I hope you post your Halloween adventures for 2017! I'm happy to hear that your son is going to get out there this year. I think I'm in good shape this year too, because my son's been talking costumes a lot. I'll probably keep encouraging him every year even if we have to go to the more 'anonymous' events like 'trunk or treat' and the like.